It’s time for another edition of Tabletop Co-Op! In this column, we take a look at cooperative games that don’t require a controller, keyboard, or tablet. Today, we trek to the stars, taking on the role of a team of trainees on their first mission. 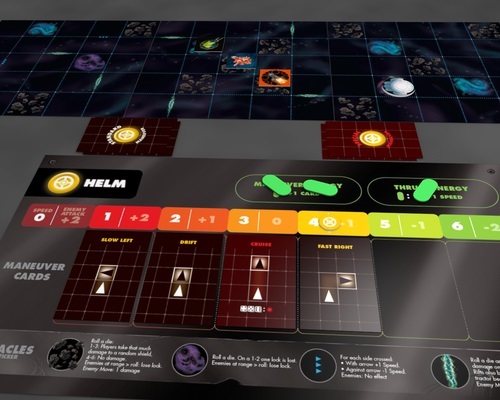 Space Cadets puts you and your friends in the captain’s chair, the engineering deck, or even at the weapons console in a way that is highly thematic. Space Cadets is designed by the Engelstein family: Goeff, Brian, and Sidney. Geoff, the father, is a contributor to the well known Dice Tower board game podcast, as well as co-host of the Ludology podcast. It is the second game design from the family, following 2011’s The Ares Project, a competitive sci-fi card game. The Engelsteins must be fans of Star Trek, as the game is clearly inspired by the hallowed franchise. 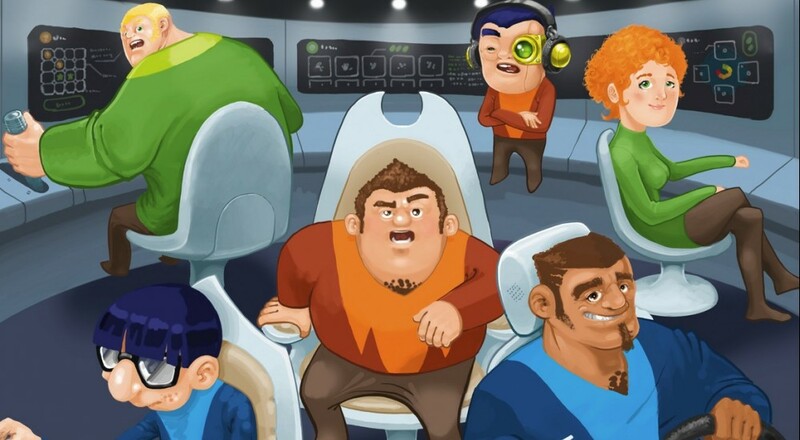 Kirk and Spock would feel right at home in Space Cadets, and I am sure that was the designers’ intent. In Star Trek, teamwork is very important, with every member of the crew having a specific role in any given mission or circumstance. Similarly, the players in Space Cadets take on roles with various responsibilities. Stations include Captain, Engineer, Weapons Officer, Sensors, Shields Officer, and a few others. The game is mission based, so it feels different each time you play. Missions feel almost episodic in nature, enhancing the theme even more. The Captain’s job is to keep the game progressing smoothly by keeping turn order moving along and making sure the varied stations work together. The first major phase is the action phase, where Engineering, Helm, Weapons, and most of the other crew perform their tasks. Each of these crew members play what is basically a timed subgame in this phase. Engineering has to match symbols on tiles, while Weapons covers a grid in with Tetris-like pieces. Sensors has to identify shapes from a bag without looking, and Shields places numbered chits on a diagram with strength determined like hands in poker. If it sounds a bit complicated, well… it is. But no one ever said being a Space Cadet was easy! After the action phase comes resolution. The Helmsman’s flight plan is carried out, shields are distributed, sensor locks are made. Weapons are then fired by flicking a wooden disk shuffleboard style. Success here is dependent on how each member did in the action phase. If the Sensors officer did her job and got a lock on the enemy ship, Weapons has a much higher chance of doing high damage. But if the flick goes poorly, the lock is wasted for that turn. Similarly, if Shields planned to encounter an obstacle on the starboard side, and placed extra shields there to prepare, but the Helm couldn’t get turned around properly, the ship might be exposed to damage. One one hand, the sense of teamwork when things work right is extremely positive, but on the other, when things doesn’t go to according plan because one person made an error, it’s hard to keep from being frustrated. Page created in 0.7416 seconds.